It’s that time of year again. Time for pumpkin-everything. Tom gave me the idea for these when we were watching football, treat drinking pumpkin ale and munching on nachos. Pumpkin nachos? Why not? Nachos are really just a vehicle for cheese and toppings. So, more about I roasted some pumpkin. That went over tortilla chips with some hot Spanish chorizo (smoked paprika + winter squash = awesome), diabetes and pregnancy green onions and shredded Colby and Jack cheeses. Into the oven until the cheese was seductively melty, then a squeeze of lime and sprinkling of fresh cilantro. Behold my terrible knife skills! Salty chips, sweet pumpkin, spicy chorizo all under a blanket of cheese. It’s delicious. The perfect Fall football food. Actually, the perfect Fall food, no matter what you’re doing. Feel free to roast the pumpkin a day or two in advance, but I really wouldn’t use the canned stuff here. Preheat the oven to 350°. 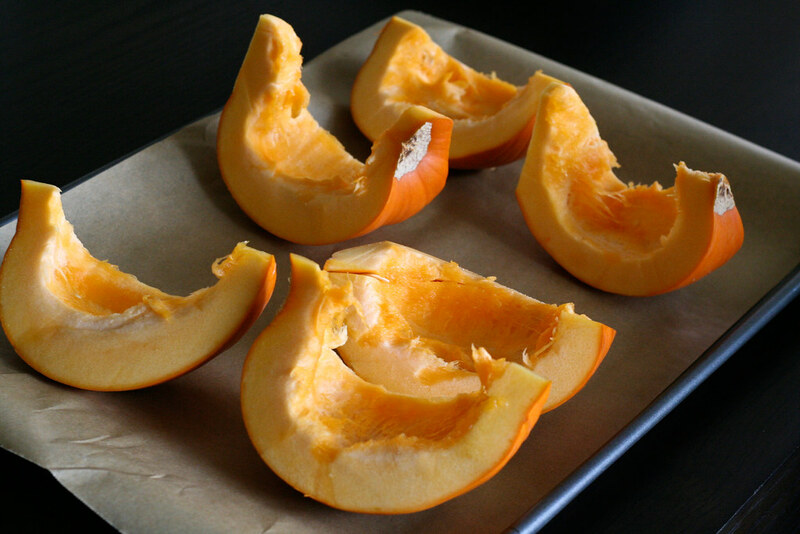 Cut your pumpkin in half and scoop out the seeds and other “innards” (save the seeds for toasting). Cut the halves into about 3 pieces and place them on a cookie sheet. Roast in the oven for about 45 minutes, or until the pumpkin is tender. Remove and let cool a bit. When you’re pumpkin is cool enough, remove the skin and cut or mash the flesh into pieces. If your pumpkin feels watery, squeeze out the excess water with a bit of cheesecloth or a fine-mesh strainer. This can be done a day or two in advance. Remove the casing from the chorizo and either dice it or place it in the food processor and pulse until finely diced. Set the oven to 325°. Line a cookie sheet with parchment paper (optional) and place the tortilla chips on it in an even layer. You want every chip to have some toppings. Add the pumpkin in an even layer, then the chorizo, green onions and cheese. Bake for 10 – 15 minutes or until the cheese is fully melted. Remove from oven and spirnkle all over with lime juice and cilantro leaves. Serve immediately. Makes a huge plate of nachos! What a fabulously original idea! I would love something like this! I barely have words for this. YUMMM! Pumpkin has to be my favorite thing about fall and you’ve used them beautifully. Chips, cheese, pumpkin, meat – I think you covered all the food groups. As a side note…your pumpkins to be roasted look so much better than mine before it goes in the oven. Not terrible knife skills at all! I don’t know if you could have gotten any more of my favorite things in one place! Ok, that’s it! I do a weekly cooking challenge on Facebook and this week’s challenge is pumpkin. I’ve changed my mind on what I’ll be making so many times. No more deciding. This is the recipe. Keep an eye out for my post on Facebook at http://www.facebook.com/home.php?#/pages/The-Weekly-Cooking-Challenge/104402147712?ref=sgm. 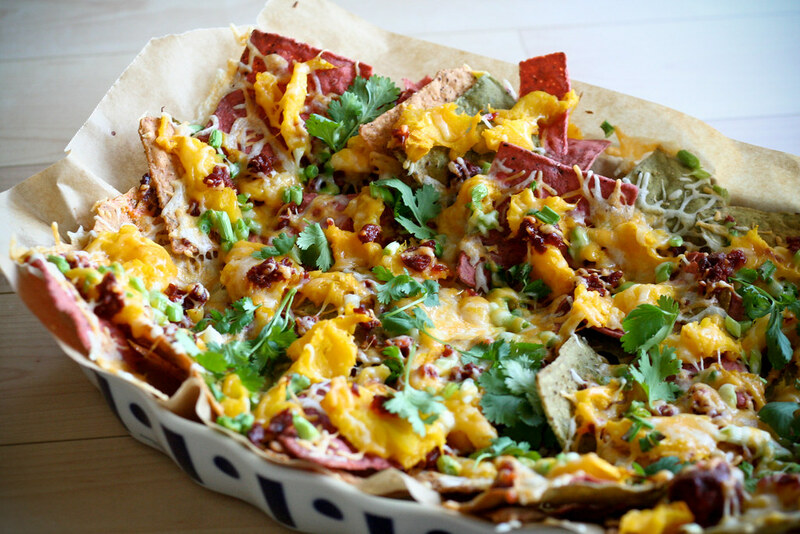 Your nachos look amazingly good! Nice blog BTW! Done! Fabulous recipe and a great way to get my teenage son to eat pumpkin. He said it wasn’t bad. That is a huge compliment. My husband and I thought it was great! Good job! Sorry for the late comment, but I just made these tonight. They were so good! I used butternut squash instead of the pumpkin and some manchego cheese….the combination of flavors was even better than I was hoping. Thanks for the recipe! it looks nice !!!! i love it ! i love it !!!!!!!!!!!!!!!!!!!!!!!! it looks great! who made this is good at cooking.